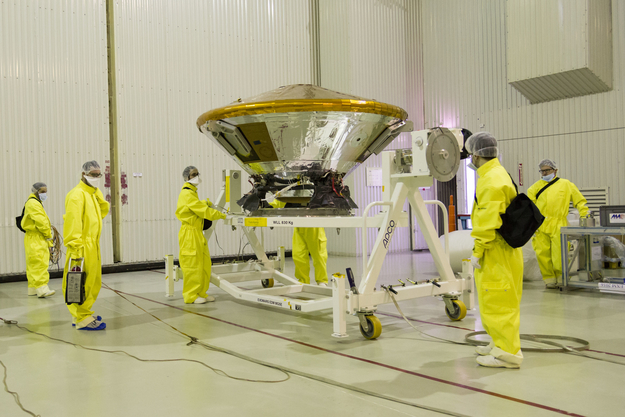 The ExoMars 2016 entry, descent and landing demonstrator module, Schiaparelli, being transported from a cleanroom to the fuelling area, in the Baikonur cosmodrome, where it will be united with the Trace Gas Orbiter. Schiaparelli has been fuelled and the presence of hazardous hydrazine means that special precautions need to be taken by anyone working in the vicinity. The team moving Schiaparelli wear yellow protection suits and carry gas masks (in the black bags). In addition, one of the team (on the left) carries a portable hydrazine detector.